Partners of the ‘Ridge to Coast, Rain to Tap’ project in Cagayan de Oro (Philippines) held their first Steering Committee meeting today. During a festive gathering, COWD, FRRL, Red Cross, Unifrutti/Hineleban, Wetland International, VEI and the Netherlands Embassy signed the partnership agreement. 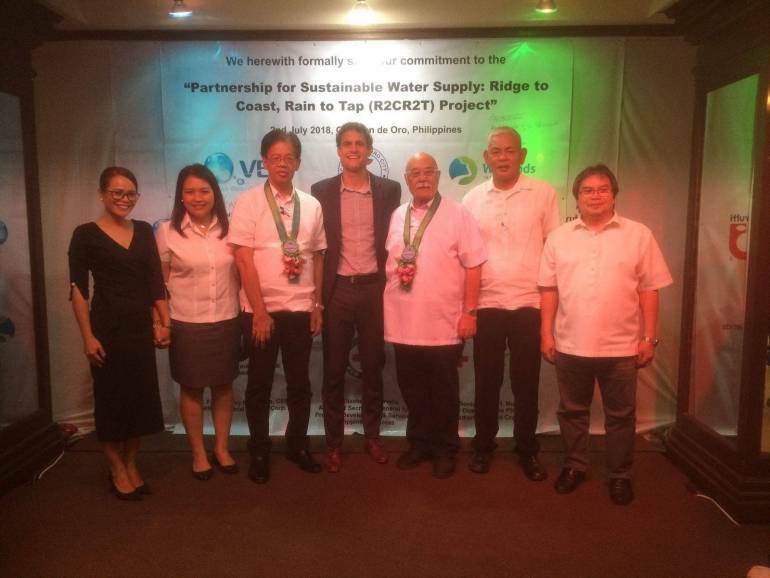 This interesting RVO-FDW funded project links reforestation and agricultural practices, flood protection, river basin management, water supply and disaster management activities to address water and socio-economic challenges on Mindanao. On the picture we see Adriaan and his office manager Apple Flores together with the management of Cagayan de Oro Water District (COWD). We wish the team all the best and look forward towards the implementation!